Food journaling has never been easier with food-tracking apps that download right to your smartphone. Some of these food-tracking apps use your phone's camera to scan food label barcodes to make it easy to track calories, macronutrients, and protein amounts of the food you eat. With more than 6 million foods in its database and more than 4 million food barcodes, MyFitnessPal makes it easy to log breakfast, lunch, dinner and afternoon snacks. With powerful metrics, My FitnessPal gives insights on calories, fat, protein, carbs, sugar, fiber, cholesterol and vitamins, it's easy to plan your meals in advance and stay on track with your nutritional goals. The ability to connect with friends, and get motivation from the My FitnessPal community. Smartphone interface can be clunky to use and difficult to enter meals quickly. 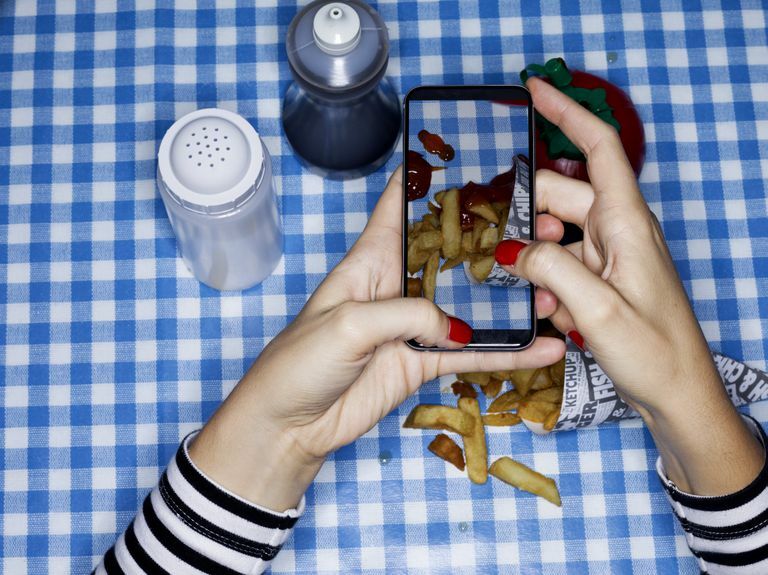 Rather than typing a daily log of your meals, snap a photo instead. See How You Eat, by Health Revolution Ltd, is an app built on the belief that seeing what you eat can help you make more positive dietary changes and help you check to see if you're eating from the rainbow. This food-tracking app does exactly what it says – it simply lets you document your meals visually, without any complicated calorie or macronutrient support. Simple, quick and easy way to make a food journal, with the ability to share photos on social media. Lack of photo editing capabilities. We all start out with the best intentions when it comes to eating healthy. But hunger, life, crazy schedules and cravings often get in the way. MyPlate by Livestrong.com, is a food-tracking app that lets you create customized goals for macro and micronutrients and provides a comprehensive dietary analysis of the food you're taking in. Daily summaries are useful in helping you see how close you are to staying within calorie limits. Entering home-cooked meals is tedious as each ingredient must be entered individually. Protein Tracker: Are You Giving Your Muscles Enough Fuel? Like the name implies, Protein Tracker tracks the amount of protein you eat. Once you enter your daily protein goals, this food tracking app shows you the percentage of your daily protein goal by calculating how much protein you eat each day, as well as a historical view over time. Protein calculator to help you figure out your personal protein needs. When it comes to eating healthy, it's not just the calories, but the quality of your food that counts. Fooducate, by Fooducate LTD, provides a comprehensive database of 300,000 foods found in supermarkets. Simply scan the barcode with your smartphone camera to get in-depth nutritional analysis of added sugars, trans fats, high-fructose corn syrup, food coloring, genetically modified organisms (GMO), additives, preservatives, and artificial sweeteners. Personalize your tracking by entering your weight, age and fitness goals. Takes the guesswork out of finding truly healthy foods by providing solid facts. Serving sizes are based on imperial units, not cups. The app can be expensive for full features. If you're confused about how to count your macros, Stupid Simple Macro Tracker, by Venn Interactive, can help. More than tracking what you eat, this food tracking app tracks your fat, protein, and carb levels. Customize your own macro levels and tag them with food icons to make it fast and easy to log your daily macros. The food bank feature lets you conserve calories for special events. Can sometimes be slow to load. In addition to tracking food, the Ultimate Food Value Diary, by Fenlander Software Solutions, Ltd, tracks exercise, weight, and your measurements. This food app uses calorific values to calculate food values using the standard macronutrients of protein, carbs, fat, and fiber. The Meal Maker feature allows you to group items together for an automatic portion calculation. Unable to import a traditional recipe. Lifesum, by LIFESUM AB, is a food-tracking app built on the idea that observing small habits can make a big difference toward meeting nutritional goals. With a comprehensive list of recipes and meal plans, Lifesum also includes barcode scanning and macro tracking to see your daily nutrition and calories. The beautifully-designed interface makes the app easy to navigate. Some of the nutritional values of foods can be inaccurate as they are user-created. Premium features are expensive. Once you start tracking your food, you'll quickly begin to see that what you think you're eating rarely matches up to what you are actually eating. iTrackBites uses a point system to help you see how close you are to your nutritional goals. Tracking points is easier than tracking calories. Unable to manually type in your food, as it must be pre-loaded into the app.